The time has come, yet again, for all of Chicago to take part in one of the most culturally impactful festivals of the year. For 29 years, the Chicago Latino Film Festival has altered the Latino narrative and changed perception by showcasing the works of talented filmmakers, locally and across the globe, a feat Pepe Vargas, founder and executive director of the International Latino Cultural Center, said was a necessity. If you find yourself unable to attend most screenings, Vargas suggests you head over to some of the gala events, where you will have the opportunity to mingle with some of the filmmakers and actresses at this year’s film festival. Night of Argentina: “Marriage,” Carlos M. Jaureguialzo’s new film starring Cecilia Roth (“All About My Mother”, HBO TV series “Epitafios”) and Dario Grandinetti, will be shown at the Festival’s Night of Argentina gala event, Friday, April 19th. Closing Night: The sci-fi romantic comedy “The Man From the Future,” written and directed by Cláudio Torres, will be presented during the Closing Night gala, Wednesday, April 24th. “Each year, I have more energy and I am more optimistic. Knowing that this festival has become a gem in the city of Chicago has given me the energy to get out of bed and continue to use this great platform as a way to share our story,” said Vargas. 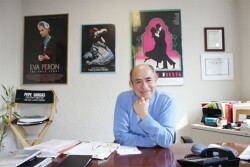 To learn more about CLFF, visit www.chicagolatinofilmfestival.org. Or visit, www.lawndalenews.com to catch movie trailers and interviews with some of the filmmakers at this year’s CLFF.